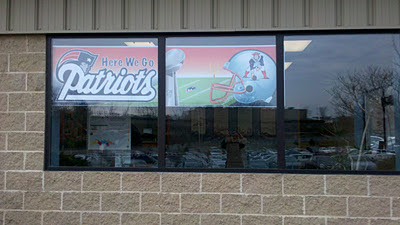 Curry's employees are experiencing Patriots Fever. The temperature is rising at Curry Printing. The employees at Curry are big fans of The New England Patriots and are excited for the big Superbowl Game this Sunday, February 5th. To kick off the big weekend, Curry's employees will be having a Superbowl party at noon on Friday where lunch will be served along with prizes and other fun activities. Curry's Patriots Fever is lead by none other than the owners themselves... Peter, Joe & Bob Gardner. The Gardner's are huge Patriots fans and have season tickets (Picture to the right: Curry's President, Peter Gardner & son Declan at the AFC playoff game). 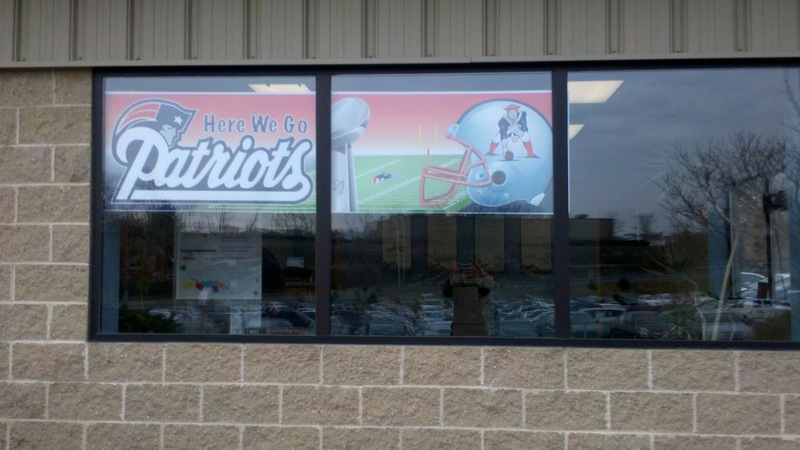 We have our American, Curry and the Patriots' flags flying high out front at our main production facility and window banner at our Worcester location (see below) to help set the tone for another Patriots' Championship victory. Show your support for the Patriots by posting a comment below! Do it again, P A T R I O T S ! ! ! !